Nest Campers are the perfect budget-friendly way to explore Slovenia and beyond! These camper vans are not your typical expensive motorhomes, but simple and efficient mini campers that have everything you would need to make the most of your time in this part of Europe. Road trips with Nest Campers are simple, easy and fun! Having the freedom to simply decide to park on a beautiful mountain road to have your lunch, or to wake up relaxing in a quiet campground space instead of whenever the door-knocking cleaning person wants you to check out? A generic hotel room is fine, but imagine the views out your window at sunrise in the Triglav National Park, or how nice it will be to simply step out the door and jump into Soča river or take a swim in the lake. All our vehicles are less than 1 year old and are serviced and maintained regularly. Vehicles are fully demonstrated on check-in. We invest in having the most fuel efficient fleet. We don’t rent old bangers! We make your travel budget go kilometers further with our modern fleet + lower fuel consumption, saving you money. What's better than unlimited kilometers and an option to go wherever, whenever? Plus a 24/7 roadside assistance. Too good to be true? Well, thats's how we roll here at Nest Campers. Last minute change of flight time? Change of pick-up location? Pick-up or drop-off at a specific location in the city center? We don't see a problem in that. We're here to help us much as we can and we'll do everything we can to meet your plans and make your holiday easy and stress free. Our main goal is to be the cheapest and the best campervan rental company in this part of Europe and that's exactly what we are. With us, there are no hidden fees – clean linen, frisbee, playing cards, cooking equipment, fridge – we don't charge extra for that! Plus you have your own fully equipped kitchen in each campervan which is great way to save money. Look for Lidl or Hofer, the cheapest grocery stores and then find your perfect dinner spot. In a Nest camper van you won´t need to plan your trip. You just follow the good weather and enjoy where it takes you. When you have a camper van, you can drive as little or as much as you want! If you really love a certain area that you are traveling, stay another night! 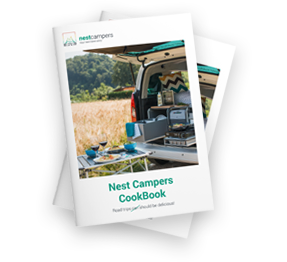 What is more – we'll give you our Nest Campers brochure on your arrival with amazing tips and information about best places to see around here. Packing and unpacking, and packing and unpacking again can be a real downer when you go on a long trip, especially if you stop in multiple cities or towns. In your camper van you can easily stash your belongings in its plentiful storage space, and forget about it while you’re taking your vacation. It’s really just that easy. The landscape in Slovenia and surrounding countries is really beautiful. Around every corner, you will find something different and equally as beautiful. Camper vans allow you to wake up to that incredible nature! Whether it’s a long haul or festival hop, Nest Campers are the ideal way to get connected to the places, people and events in this part of Europe. It's really easy to make new friends around a campfire! We said 10 reasons, right? Well here at Nest Campers we always go that one step further so here is one more reason to book your Nest camper van and start an amazing travel story. As we said – we really care about our costumers! In each campervan there is a welcome packet waiting for you and believe us, you won't be dissapointed. The content of the packet is carefully selected to make your road trip even better. Want to know what's inside? Come and see for yourself.